I always knew the day would come. That is, the day I would have to pay attention to my diet again. Having owned restaurants for several years, I didn’t pay much attention to diets. I was more interested in quality control and so sampled every day from the more than 100 items on our vast menus. I pat myself on the back to say the quality was good because of this personal practice. However, my waistline grew… seemingly on its own without my awareness. You know, you wake up one morning and say…. how did I get like this? Looking back on the road of tasty treats, I realize the detours I took. So now…. the doctor says, it must be gluten free…. dairy free. Seems as if the proteins in gluten and the casein from cow’s milk and dairy products slip through my intestinal wall directly into the bloodstream. And then my strong immune system begins to attack my own body!! It is happening to more and more people every day. Sooooo….. It has become a time to learn a new way of eating and cooking…. without gluten…. 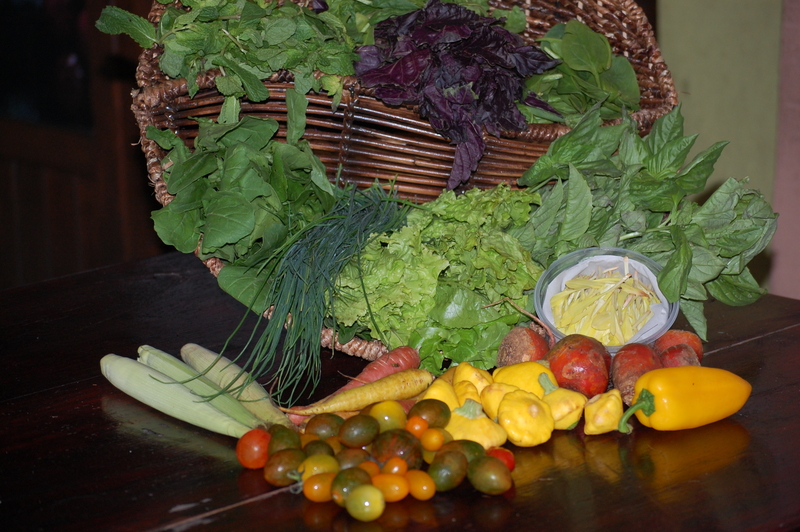 without dairy…..
Each week, I receive a basket filled with fresh organic veggies. And am learning new ways to cook and eat. Seems like we have been receiving a lot of those little yellow summer squashes lately, so I made a fantastic gluten free, dairy free vegetarian lasagna yesterday. And for those of you who have been urging me to share my recipes, here goes. First of all I want to tell you about amaranth. Here in Mexico, you usually see amaranth, a traditional staple of the ancient Aztec diet, made into honey laden cookie bars. But I also saw it in a huge bag near the oatmeal. So I thought, let me try it. It says gluten free. First thing I did was to bread and brown the squash with the amaranth and free range duck eggs in a little olive oil. Saute the tomatoes that are going soft with and onion and some garlic. When they all become very soft, add water and a little sea salt. Let the mixture simmer for the flavors to meld. Also add some basil and oregano to bring out the flavors of the tomatoes. Let sit and then blend all in a blender and put aside. 2, Breaded Squash. You can use zucchini as well. 4. Slices of red onions to cover the squash. 9. Get creative with the veggies you have available. Mushrooms, tomato slices, spinach, lettuce, peppers, etc. 11. I used some feta mixed with green onions and I think it added the exact right flavor touch. 12. Another layer of amaranth. If you want, you can also add another layer of tomato sauce. Take off the cover and bake for another 30 minutes. Served with some Kalamata Olives to put this flavor mix over the top.